Oops, I think I missed the attachments. Here they go. > Yep, all queries were identical. > performance measuring tool, shipped with BIND (as I know). > but I'm not sure about this..
> counts these as "successful responses", I'll look after it. > I could find is in the "/var/log/named/bind-queries.log"
>> > sure, slip to 2. 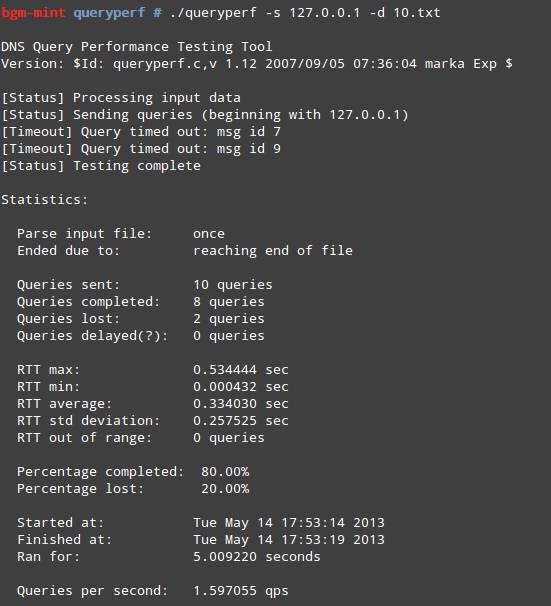 >> > I have sent 1000 queries to the server with the queryperf script. >>   answered can be penalized for up to window seconds (default 15). >> > queries -->5x131.8=659 successful queries at all minimum. >> > (about 170 queries) should be also successful. >> > So at all, it should be 170+659=859 successful queries out of 1000?" >> Were all of the queries identical? >> is too slow for hardware made in this century. >> each query and what did.